The Indigenous female body within mainstream culture has been regarded as a place of exoticization and romanticization, which has lead to the unfair societal treatment of Indigenous women. For decades mainstream fashion has repeated trends of incorporating imitation hide, beads and feathers, dream catchers, medicine wheels, war bonnets and headdresses. 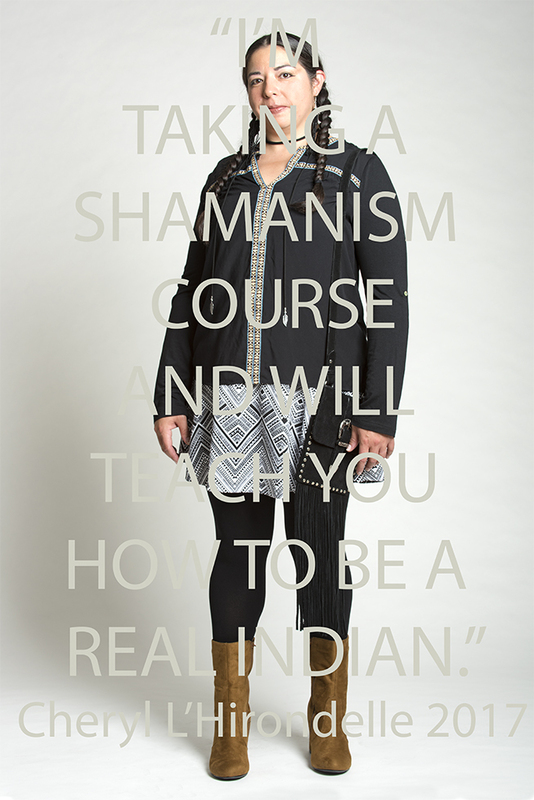 Appropriated Indigenous symbols and imagery continue to be used in women’s mainstream fashion lines. Quite often the integration of this iconography perpetuates the indigenous female body as a sexually charged space. Advertisements that portray a scantily clad woman dressed with beads and feathers continue to reinforce the age-old stereotype of the Indigenous Woman as the ‘Indian Princess Damsel in Distress’; a stereotype perpetuated for decades by the film and television industry. 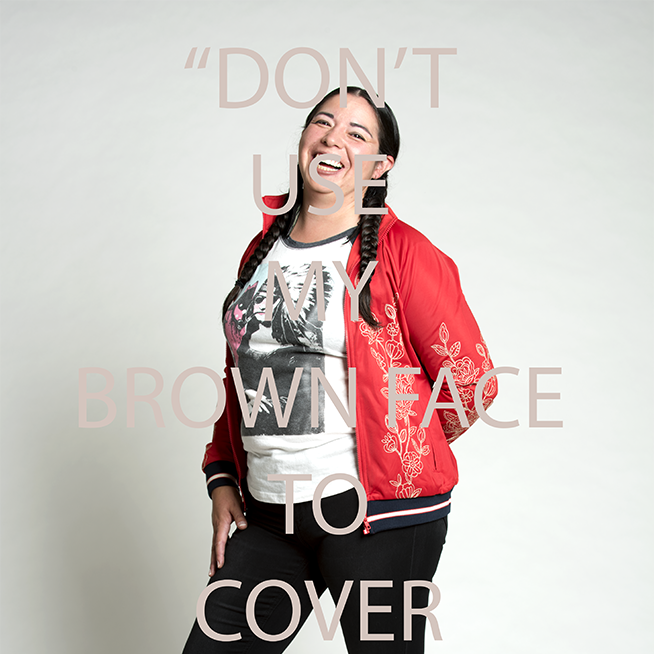 Indigenous female artists, musicians, writers and scholars have been working for the same amount of time to engage the public in dialogue around the inappropriateness of this portrayal. This project is based on how pop culture mainstream fashion has used Indigenous iconography to sexualize, objectify and commodify the indigenous female body. The work features 4 photo-based portraits of the artist wearing clothes purchased from popular hipster mall stores. 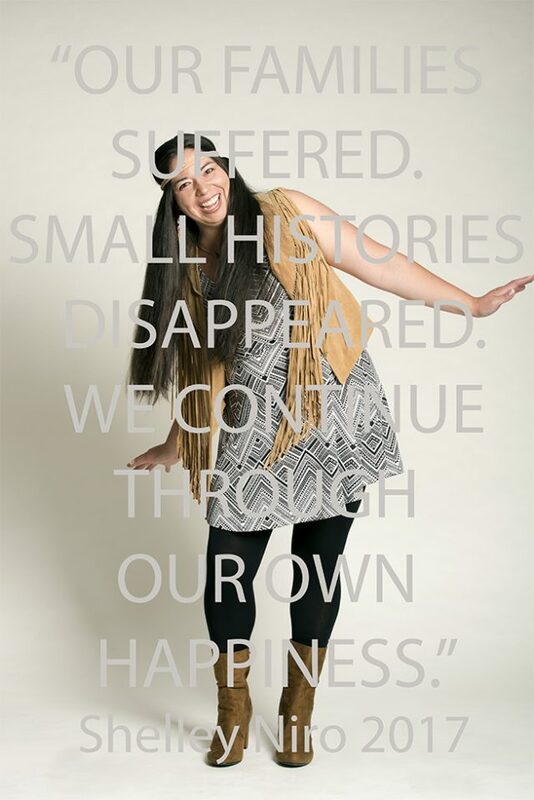 Quotes from four Indigenous Female Performance artists have been paired with each photo creating a text based infiltration of the fashion photography frame. This work is made possible with the generous support of the respondents Rebecca Belmore, Lori Blondeau, Cheryl L’hirondelle and Shelley Niro.